We’re happy to announce the release of Gliph 2.0 for iPhone. 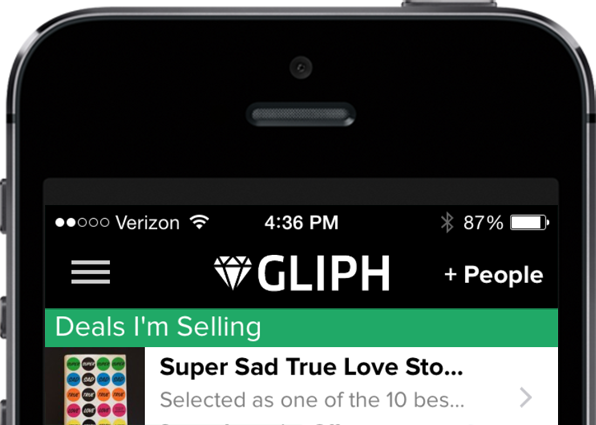 For the first time, you can now create, browse and purchase items from Gliph Marketplace from the Gliph iPhone app. Using cash or Bitcoin to complete a P2P transaction has never been easier! You can chat directly with a buyer or seller, make an offer or leave a deal with ease. Push notifications keep you informed of deal progress. Gliph for iOS 2.0 includes an updated color set and improves the usability of the app. By default, the app is brighter to look at, and +People button has been added to clarify how to add friends or create Groups. The updated Activity view makes it easy to see items you’re buying or selling in Gliph Marketplace. Listings you’re actively working with are shown right above your conversations. Once you’ve completed or left a deal, these are moved back out of the activity view. In Settings you can now enable a “Dark Mode” which turns the title bar black across the entire app. This subtle change to the look of the app may be attractive if you want to keep a low profile and aren’t big on the new brighter default look of Gliph. This entry was posted in Gliph iPhone App, Gliph Marketplace, Payments, Transactions, User Experience on February 3, 2015 by rob. Today we released a big update to Gliph for Desktop Web that includes support for Gliph Marketplace, updated user profiles and other stellar enhancements! The Activity Sidebar (left side of the web app) now shows both recent conversations and the listings you’re actively engaged with in Gliph Marketplace. 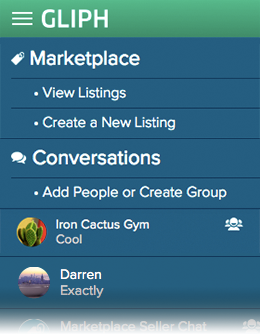 You can also Create a Listing or add People or a a Connection or Group from the sidebar. If you click Marketplace, you’ll be taken to Marketplace Home, which lets you view current deals and past deals you’ve engaged with in Gliph Marketplace. This entry was posted in Bitcoin, Gliph Marketplace, Gliph Web App, Payments, Transactions on February 3, 2015 by rob. Today marks an important expansion of Gliph with the release of Gliph Marketplace: a new way to buy and sell locally using cash and the Bitcoin digital currency. Our team has brought together secure messaging, transaction workflow and digital payments into an awesome new P2P transaction experience we call Deal Flow. Deal Flow saves you time with intuitive listing status updates. For example, when someone is ready to buy something from you, the status moves from “Q&A” to “Offer Submitted.” Deal status updates ensure you have the most recent information so you can make the best decision with your time. Deal Flow earns you money faster by making digital payments an integrated part of the Gliph Marketplace experience. Once you’ve accepted an offer, paying for the item using Bitcoin is handled in a single tap. This entry was posted in Bitcoin, Gliph iPhone App, Gliph Marketplace, Gliph Messaging, Gliph News, Gliph Platform, Payments, Privacy, Transactions on January 5, 2015 by rob. Over the past few months the Gliph team has been working on a project to improve how things work behind the scenes. If you’re following the company and want the inside scoop on what’s new that you can’t see, this blog post is for you. We’re excited about improving peer-to-peer transactions and providing a great platform for identity. In following this passion, we’ve iterated on Gliph by adding new features and changing the way the system works. Some of the additions were in response to insights along the way. For example when we learned that the majority of Craigslist deals were handled via email and lacked privacy, we built Cloaked Email to make that a better experience. Later, we realized Bitcoin would be a a fantastic way to close transactions and built in simple Bitcoin transfer into Gliph secure messaging. We’ve learned a lot about email and believe communication can be faster and better than that. GliphMe‘s secure and private instant channel is the first of our efforts here. This entry was posted in Gliph Android App, Gliph iPhone App, Gliph Messaging, Gliph News, Gliph Platform, Technical, Transactions and tagged architecture, progress, refactor, technical debt on April 21, 2014 by rob. 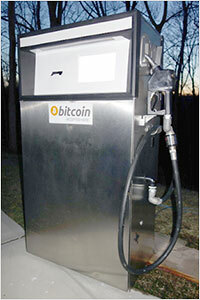 Sit back and imagine a future where you pull up to a pump and pay for your gas using Bitcoin. This vision may be closer than you think. Thermo dynamics researcher, Bitcoin enthusiast and DIY pro, Andy Schroder, has just created the world’s first commercial-ready Bitcoin fuel pump. Schroder built the machine from scratch, integrating components that would handle Bitcoin’s specific requirements, offer solid uptime and work within the national standards for dispensing fuel commercially. From a distance, Schroder’s fuel pump looks like one you would find at a mom and pop style gas station; the size is a bit shorter than what you’d normally see at a 76 station today. But the small-town sentiment ends when you walk up to the machine. This entry was posted in Bitcoin, Payments, special interest, Transactions, Video and tagged diesel, diy, gasoline on April 21, 2014 by rob. We’re launching a new version of Gliph for iOS 7 today with a raft of updates that make Gliph more useful and easier to use. But first, some important news about Bitcoin. We were asked by Apple to remove the ability to send Bitcoin from the iOS app. We fought to keep it in but it was not possible. You can read more about what happened in a special blog entry we wrote about mobile apps in the App Store and Google Play.You can still create wallets, view balances and receive Bitcoin in the Gliph app for iOS send Bitcoin using Gliph on iPhone, using the same interface as before. Just visit https://gli.ph/m when you need to send Bitcoin, and continue using the app for normal push notifications and messaging. We removed the option to create or attach a wallet from european wallet provider BIPS, which has decided to shutter its consumer-facing Bitcoin wallet service in the wake of a security breach. Usually, there is cool news about Bitcoin and Gliph but not in this release. Hang with us, we are in it to win it with Bitcoin. This is just the pre-season. Gliph’s implementation of Bitcoin will come back harder, faster and stronger no matter the platform. You can now delete all messages in a conversation from the activity view. That’s right, just swipe a conversation to the right and choose Delete Messages. Learn more about permanent message deletion on Gliph. You now tap the information button in the title bar to view connection settings and choose a tag for a connection. This entry was posted in Bitcoin, Gliph iPhone App, Gliph Messaging, Payments, Transactions, User Experience and tagged flat design, iOS 7, UX on December 8, 2013 by rob. We are proud to announce that Gliph now supports simple peer-to-peer (P2P) mobile payments using Bitcoin digital currency. You can now send Bitcoin with other Gliph users using updated versions of our iPhone, Android and web applications. We have an iOS demo video up if you’re hungry to see how it works. Also a step-by-step guide to setting it up for Android and for iOS. But this is more than just a new feature for us and we wanted to go into detail as to why we’re adding Bitcoin to the Gliph platform. Over the past several months the Gliph team has been fascinated by Bitcoin. Bitcoin brings privacy to payments that is unavailable with traditional banking. The software behind Bitcoin is open source and has sustained great scrutiny. The currency itself is distributed, and transfers can take place with little or no fees at all. We love that no one company or government controls Bitcoin, and that even its creator(s) are shrouded in anonymity. We believe Bitcoin and the ideas behind it have the power to change the world. This entry was posted in Bitcoin, Gliph Android App, Gliph iPhone App, Gliph Messaging, Gliph News, Gliph Platform, Gliph Web App, Payments, Privacy, Transactions and tagged bitcoin on May 17, 2013 by rob. Today, we’re turning some surprise Bitcoin functionality on for all Gliph iPhone users. The most recent version in the App Store, version 1.47 now allows you to send Bitcoin. This entry goes over how to use Bitcoin functionality in the app. If you haven’t, you may also want to read about why we added Bitcoin or how to use Bitcoin with the updated Gliph Android app. This entry was posted in Bitcoin, Craigslist, Gliph iPhone App, Payments, Transactions and tagged bitcoin on May 17, 2013 by rob. We are happy to announce that Gliph has joined the Boost VC startup accelerator. Gliph will join around a dozen other companies in a business incubation that includes mentorship, seed capital and a heavy focus on product development. Beginning late June, Gliph’s founders (Rob and Nick) will relocate to Boost’s provided housing and office space in San Mateo, California. There we will join a group of startups specifically focused on the Bitcoin digital currency. The team will be working throughout the summer to refine the Gliph experience and further integrate Bitcoin into Gliph’s digital identity platform. This entry was posted in Bitcoin, Gliph News, Payments, Transactions, Uncategorized and tagged california, funding, startups on May 17, 2013 by rob. Bitcoin burning a hole in your e-wallet? With a growing number of craigslist sellers stating they’ll trade in Bitcoin, we thought we’d share a fun snapshot of what you can buy on craigslist with Bitcoin in Portland, on Monday, April 8th, 2013. Prices calculated at current $184 / 1 BTC. Update: Hello Digg and other folks. Gliph is a technology startup based in Portland, Oregon. If this is your first time hearing about Gliph, welcome! Gliph is a digital identity platform that lets you send secure messages and complete transactions with people. You can download our iPhone or Android app. We also have a great mobile web application. You can follow the company on twitter @gli_ph. Something awesome you can do right now with Gliph is protect your email address from spammers and scammers using Cloaked Email. Try it out! This entry was posted in Bitcoin, Craigslist, Transactions on April 8, 2013 by rob.